Can an Olfactory Nerve Determine With Whom We Fall in Love? Recently, a reader asked about the most unusual research that I used to create a story line. That research is the one I used to write my contemporary novel, Second Chances: The Courtship Wars. The article listed above comes from the Today Show archives. I was watching the show on the day of the original telecast, and I thought “Gee, that would be a good idea for a story’s plot line.” It was another of those bizarre facts which fill my brain. They end up as the medical experts on a reality TV show, called “Second Chances.” The premise behind the show is that the couples competing on the show were married (once upon a time) and now divorced. They wish to remarry, and Lucian and Gillian are attempting to determine whether that is such a good idea. The American public votes each week for the couple who they believe stand the “chance” of having a successful marriage the second time around. I do not suppose I need to tell you that the sparks between Lucian and Gillian, first in anger and then in passion. The viewers note the pair’s attraction, and so do the producers of the show, who throw Lucian and Gillian into the fray. That being said: What makes us fall in love? Is it lust, mutual interests, shared life goals, or something much more intangible? Recent research suggests the latter. Researchers discovered an olfactory nerve that they believe is the route through which pheromones are processed. Nerve “O,” (Nerve Zero) as it is called, slipped under the radar for many years because it is so tiny. However, once discovered in a whale, scientists surmised that this little nerve might be found in humans as well. And it was! So what is the role of Nerve “O”? Nerve “O” has endings in the nasal cavity, but the fibers go directly to the sexual regions of the brain. Indeed, these endings entirely bypass the olfactory cortex! Hence we know the role of Nerve “O” is not to consciously smell, but to identify sexual cues from our potential partners. What sexual cues do our scents give off? For one thing, we are more likely to be attracted to people whose scent is dissimilar to our own. Family members often share similar chemicals, so our attraction to differing chemical makeup suggests that sexual cues evolved to protect close family members from procreating together. On the other hand, pregnant women have shown to be more drawn to people with similar chemical makeup, which might be due to the fact that during this crucial time, women are more apt to seek out family members than potential mates. Research also showed that these unconscious cues processed in Nerve “O” can make or break a relationship. Couples who have high levels of chemicals in common are more likely to encounter fertility issues, miscarriage, and infidelity. The more dissimilar your and your partner’s chemical makeup, the better chance you will have at successfully procreating and staying together. Rushing through the concourse to make her way to the conference stage, Gillian Cornell comes face-to-face with the one man she finds most contemptible, but suddenly her world tilts. His gaze tells stories she wants desperately to hear. As he undresses her with his eyes, Gillian finds all she can do is stumble through her opening remarks. The all-too-attractive scoundrel challenges both her sensibility and her reputation as a competent sexologist. Dr. Lucina Damron never allows any woman to capture his interest for long. He uses them to boost his career and for his pleasure. Yet, Lucian cannot resist Gillian’s stubborn independence, her startling intelligence, and her surprising sensuality. Sinfully handsome, Lucian hides a badly wounded heart and a life of personal rejection. Thrown together as the medical staff on “Second Chances,” a new reality show designed to reunite previously married couples, Lucian and Gillian soon pique the interest of the American viewing public, who tune in each week, fascinated by the passionate electricity coursing between them. Thus begins an all-consuming courtship war, plagued by potential relationship-ending secrets and misunderstandings and played out scandalously on a national stage. 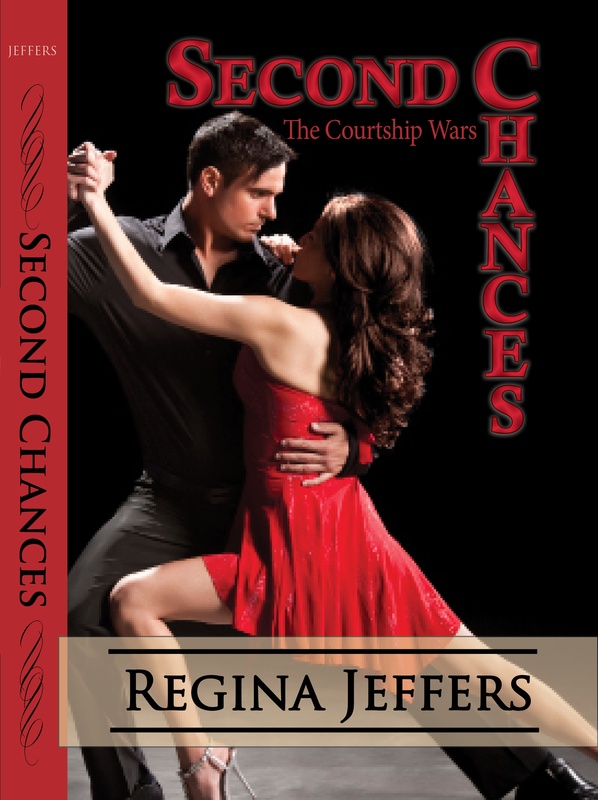 Giveaway: Leave a comment below to be in the mix for one of two eBook copies of Second Chances: The Courtship Wars up for grabs. The giveaway ends at midnight EDST on September 30, 2015. What of the research? Could you imagine a reality TV show such as the one in the book? Should those who divorce ever remarry their former mates? This entry was posted in publishing, research, romance and tagged book blurb, contemporary, eBooks, Nerve O, procreating, psychology, Regina Jeffers, romance, Second Chances: The Courtship Wars, sexologist. Bookmark the permalink. I am so used to read about novels related to Darcy and Elizabeth that my question is if Lucina and Gillian are somehow similiar to the characters from P&P. My second comment is that I envy you sooooooooooooo much for being able to come with ideas for story´s plot lines! Your other contemporary book “Honor and Hope” is absolutely amazing and I really enjoyed it, so I am sure that I would love this one. It is on my TBR list even if I am not lucky to read it! Ana, I would not say that Lucian and Gillian are a modern day Darcy and Elizabeth. Gillian is resistant to Lucian’s charms, and there is a woman (a Caroline Bingley type), but I never set out to have this be a contemporary P&P. That being said, D & E are rarely far from my mind. LOL! I never properly promoted this book for I do not have extensive resources in the contemporary genre, but it remains one of my favorites. One of the things that endears the book to me is that Gillian has a Down Syndrome sister, who is based on my best friend’s sister, Vicki. Vicki is now in her late 50s. I am always looking for new ideas. I observe people when I am at a restaurant or the physician’s office. I can imagine that you are able to get ideas wherever you go! Love all her novels and such as I have read them on Kindle, “The Prosecution of Mr. Darcy’s Cousin” and “Honor and Hope”, I had to order them in book form and they are arriving tomorrow from Amazon. Two of my favorites, I must say so I will be happy to read this one also as it sounds mighty interesting. Mary Ann, thanks for the kind words, but next time let me know when you need books. Even with the postage to Indiana, it would cheaper to get them from me than from bookstores and Amazon. I only charge what I paid for the books. That must have been a pretty interesting research. For me, scents have a way to take me down memory lane sometimes. I would love to read this book. I hope I get lucky. I have friends from my youth who speak of how scents bring back images of their war years. We all know how we associate certain scents with people or with memories. The book is a contemporary, Glynis, so the “mores” that we accept as part of the social interactions are freer. Even so, I am not one who writes torrid scenes. What ever Regina writes, it’s always an enjoyable and captivating experience to read. After reading the introductory segment here I’m already interested in getting this book. Many thanks, Denisia. The book is a bit different from my usual fare, but it remains one of my favs. My goodness, I am afraid of what other trivia is stored in your brain’s memory banks! This sounds intriguing indeed; I could see the title as Courtship Wars: Nerve “O”. Thank you for the teaser!. Almost like, “Ground Zero,” June. LOL! The research came as a surprise to me. But now I get it and it totally makes sense. Thank you for sharing this tidbit, Regina. I look forward to be enlightened by different subjects. The research was a “jewel” of a find, Sylvia.